Certainly not for the budget-conscious traveller, hot air balloon safaris are an expensive way to see the African wilderness, but provide unrivaled views and an experience you’ll never foret. 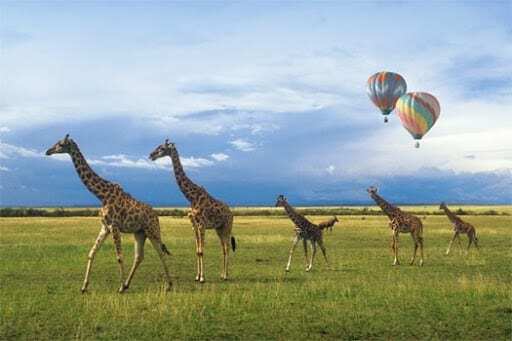 There are a number of companies in East and Southern Africa offering balloon safaris – particularly around the flat heavily touristed areas of the Masai Mara and Serengeti plains – and it can make a truly exhilarating add on to any land-based safari. Balloon safaris are easily incorporated into any existing safari itinerary which includes at least one night at a national park or reserve where they’re offered, and just as easy to arrange if you’re an independent traveler as transfers fro your lodge to and from the launch and landing site are generally included. The price for a balloon safari depends on location, time of year and company you book with, but expect to pay anywhere from $300 to $500 per person. Balloon safaris begin with a pre-dawn wake up call and quick, light breakfast at your safari lodge or tented camo. You’ll then be picked up and transfered to the balloon launch site for between 6am and 6.30am. Balloon flights typically leave around or just before sunrise, as this is the best time of day for ballooning conditions. Later in the day as the sun the land thermals and wind generally get stronger, making for a bumpier ride. An early start also gives you the best chance of seeing the African wildlife in action. As with any safari game viewing can’t be guaranteed, but with an experienced captain and guide on hand to spot game below you’ll have a very good chance of seeing a variety of wildlife for a whole new perspective. Once airborne, the balloon is blown by prevailing winds across the landscape. Aside from the occasional blast of the burners, the flights is magically silent and peacful. The pilot controls the height of the balloon – generally between 500 and 1,000 meters – and will descend for a close up view of any wildlife spotted. On landing you’ll generally be offered a brunch and drink whilst waiting for the vehicle for your return transfer – a game drive with the possibility of seeing the same herds of wildlife or dozing lions your spotted from the air. By 9.30am you’re back at your safari lodge or tent ready to relax or take a nap before lunch. Well developed for tourists, the great plains area of East Africa (Masai Mara National Park in Kenya and Serengeti National Park in Tanzania) provides a wide choice of balloon safari operators and some classic safari scenery and wildlife. This area in particular gives the opportunity of seeing one of nature’s greatest sights from the air – the great wildebeest migration, along with accompanying gazelles, zebras, lions and hyenas. There’s even a slim chance of spotting the big five in an hour from the air! Elsewhere in East Africa the giant Selous Game Reserve and Lake Manyara National Park – both in Tanzania – have a choice of balloon safari operators, along with spectacular landscapes to take in. The wetlands of Botswana’s Okavango Delta are green year round, and a haven for wildlife and bird-life. Balloon safaris here can be arranged from the tourist capital Maun, or through your lodge. Taking a balloon ride over the Namib Naukluft desert of Namibia you can see the towering sand dunes of Sossusvlie stretching hundreds of miles and up to 300 metres high. Alongside the scenery there’s plenty of wildlife clustered together around water sources, with the chance of spotting the famous Namib Desert elephants. Zambia’s Kafue National Park contain the vast Busunga Plains, a home to huge herds of grazers, plenty of large predators…and jaw dropping scenery. If you fancy a break from or extension to your safari time, Cape Town in South Africa has a range of hot air balloon rides over the Cape Winelands area. This gives a birds eye view of the beautiful wine growing regions, with vineyards as far as the eye can see. During peak season it’s advisable to try and book your balloon safari at least 2 weeks in advance. Shop around before you book – if you’re arranging your trip independently you’ll find that some balloon safaris are packaged with accommodation. It will be cold in the early morning and high in the air, so wear layered clothes – you can then remove or add as required. Sandals and open-toed footwear are not recommended as you will be doing at least some walking to and from the balloon. A comfortable pair of sneakers is recommended. Keep an eye out for any game you’re most interested in viewing, and if you spy it ask your driver/guide to take you via there on the way back to your hotel. Check what’s included with the company who are running the balloon safari. Transfers to and from your lodge, and some sort of brunch after touching down are fairly standard. As always, the more pictures you take the higher the chance of snapping the “perfect” picture. Aerial photography can lead to blurring or vibration effects, so use a fasr shutter speed, enable any auto-image stabilization your camera has and/or increase your camera’s ISO. Sun Fun Africa Safaris, offering hot air balloon safaris over the Pilanesberg National Park in South Africa. Bill Harrop’s “Original” Balloon Safaris in South Africa. Namib Sky, specializing in balloon safaris across Namibia. Can also help out with Botswana balloon safaris. Serengeti Balloon Safaris, across the Serengeti National Park, Kenya. Mara Ballooning, across the Masai Mara National Park, Kenya.